Findagrave.com, memorial #20670553. Photo by Bill Boyington. [S185] Concord, Massachusetts Births, Marriages, and Deaths, 1635–1850, 51, Thomas Brookes b. [S185] Concord BMD, 106, Thomas Brooks/Hannah Dakin m.
[S185] Concord BMD, 418, Mrs. Hannah Brooks d.
[S185] Concord BMD, 434, Thomas Brooks d. (gs). 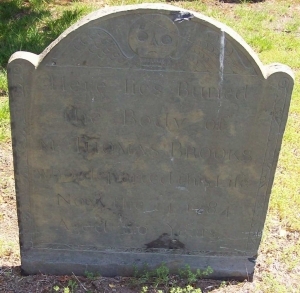 [S148] FindAGrave.com, memorials #20670553, #20670629. 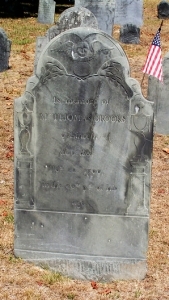 [S2363] Concord Gravemarker Data, OHBG-391, Mr. Thomas Brooks; OHBG-392, Mrs. Hannah Brooks. [S182] Lemuel Shattuck, History of the Town of Concord, 234, town officers. [S185] Concord BMD, 115, Rebeckah Brooks b. [S185] Concord BMD, 118, Aaron Brooks b. [S185] Concord BMD, 122, Ruth Brooks b. [S2363] Concord Gravemarker Data, SBG-42, Mrs. Ruth Conant. [S185] Concord BMD, 129, Luke Brooks b. [S185] Concord BMD, 135, Noah Brooks b. [S185] Concord BMD, 142, Hannah Brooks b. [S185] Concord BMD, 157, Stephen Brooks b.
Findagrave.com, memorial #26920873. Photo by BobBoston. [S368] Vital Records of Medford, Massachusetts, To the Year 1850, 32, [T]homas Brooks b. [S83] Henry Bond, Watertown Genealogies, 2:723. [S572] William Gray Brooks, "A Genealogical Account of the Brooks Family," 61, 64. [S368] Medford VR, 349, Thomas Brooks d.
[S572] William Gray Brooks, 73, citing c.r.